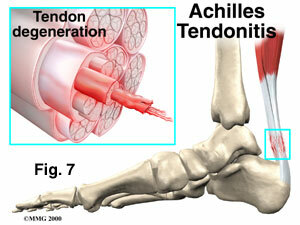 Achilles tendon injuries may occur when you are performing minor household works. Recreational activities involving jumping and running are the major causes of Achilles tendon injuries or ruptures. In sports like basketball and tennis, muscles and tendons in the back of the leg are prone to injury from an imbalance that occurs from a lot of forward motion. As a result, the frontal imbalance can weaken the tendon unless stretching exercises are performed regularly. The best way to prevent Achilles tendon injuries is to warm up gradually by walking and stretching. Of course, a simple daily exercise is the best of all. Besides, it's best to avoid strenuous sprinting or hill running if you are not in shape for it. Achilles tendon weakness is common in adults and prompt treatment when symptoms occur can prevent more serious injury. The Achilles tendon is the longest and strongest tendon in the body, but is subjected to considerable wear and tear. When the tendon becomes inflamed from excessive use, tendonitis can weaken it over time and cause microscopic tears. If left untreated, the risk for further deterioration and possible rupture increases. 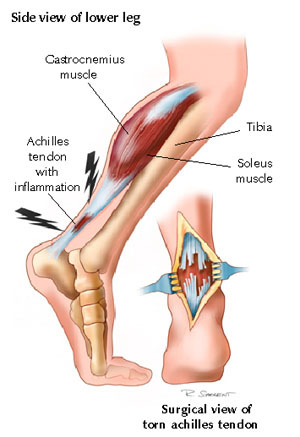 Pain, stiffness, and tenderness in the area are the main symptoms of Achilles tendonitis. Pain occurs in the morning and improves with motion, but gets worse with increasing stress and activity. Achilles tendonitis is common for those whose work routine puts constant stress on the feet and ankles. Achilles tendon injuries happen most often to less-conditioned, Sunday joggers who overdo it. Also, there are patients who have ruptured their tendons simply by climbing a ladder. When pain and other symptoms indicate possible Achilles tendonitis, the surgeon will make a thorough diagnosis to determine the extent of trauma and evaluate the flexibility and range of motion in the tendon. Treatment options depend on the extent of the injury. Casting to immobilize the Achilles tendon and promote healing. Nonsteroidal anti-inflammatory medication to reduce pain and inflammation.